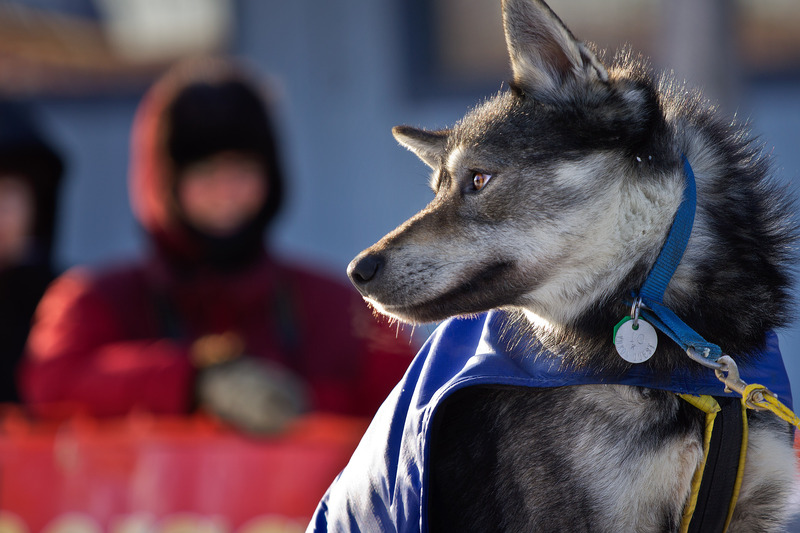 An Iditarod Lesson: "Dream Big"
In small degrees, spring is coming to Western Alaska, and it's perhaps no surprise that excitement for the future of our radio mission continues to grow. As our daylight hours increase, warmer weather is on its way. 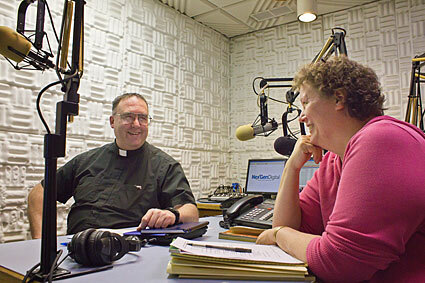 It's the Easter season, a time for renewal in many different ways, and as you'll read below, KNOM's broadcasts will allow Catholics throughout our region to practice and rekindle their faith on one of the holiest days of the year. Renewal is our goal, also, for the Tom and Florence Busch Digital Studios, a crucial renovation and construction project that, thanks to your support, continues to move forward. We're excited to report a grant of $60,000 from a Western Alaskan organization – the Norton Sound Economic Development Corporation – as well as a matching challenge pledge of $50,000 from a generous donor. You'll find more below, as well as on a dedicated information page on this website. Meanwhile, we're doing our best to keep our facilities working efficiently. Later this month, we plan to install equipment at our AM transmitter for dynamic carrier control, a type of power management that could save us 30% on our electricity bill. And as you'll read below, recent maintenance work has spared us time and headaches: both now and for years to come. As always, we are so grateful for the support and prayers you extend to our mission and those we serve. Thank you for your generosity: it is bringing hope and changing lives throughout the rural stretches of Alaska. Practicing one's faith in our region is, at times, a great challenge. Of the 24 Roman Catholic parishes within KNOM's listening range, none enjoy a full-time pastor. Currently, only 7 priests minister to these communities and others, spread out in a region about the size of California. Some of the villages in Western Alaska are able to celebrate Mass with a Catholic priest only once or twice each year. Thousands of Western Alaskans never see a priest at all, and for the thousands who do, it's never every Sunday. 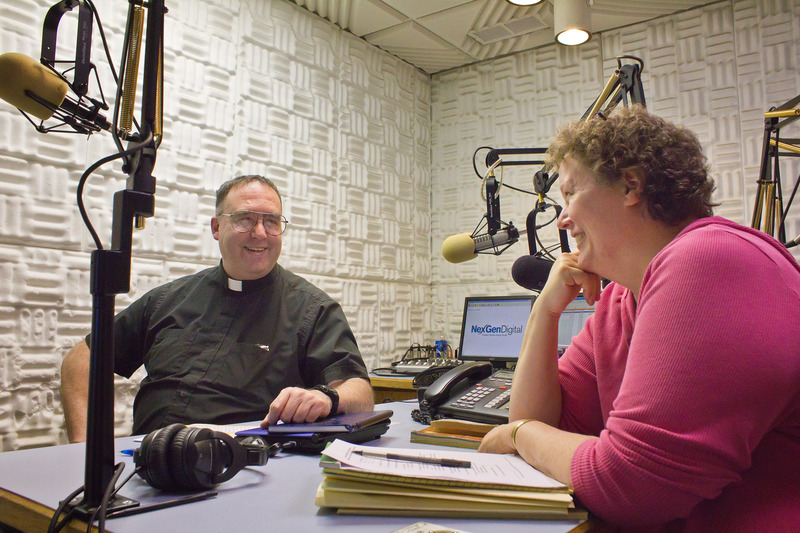 On this Easter Sunday – and on so many Sundays throughout the year – thousands of dedicated Catholics in our region will have only one opportunity to celebrate Mass: the live broadcast on KNOM, officiated by Father Ross Tozzi in Nome (pictured above in KNOM's Studio C with our business manager, Lynette Schmidt). We're told that, in some villages, listeners set up a radio in their church to pray the Mass together in their sacred space, distributing pre-consecrated hosts for communion. We're honored to provide this service, as we have since our very first broadcast in 1971, and we're so grateful for your support in making it possible. This Easter, you are keeping the Catholic faith alive in Western Alaska. Thank you – and Happy Easter! If someone is good enough to be loved by God, then that person must be good enough for me to love. It's a cause for celebration: KNOM Radio has been nominated by the National Association of Broadcasters for a Crystal Award! 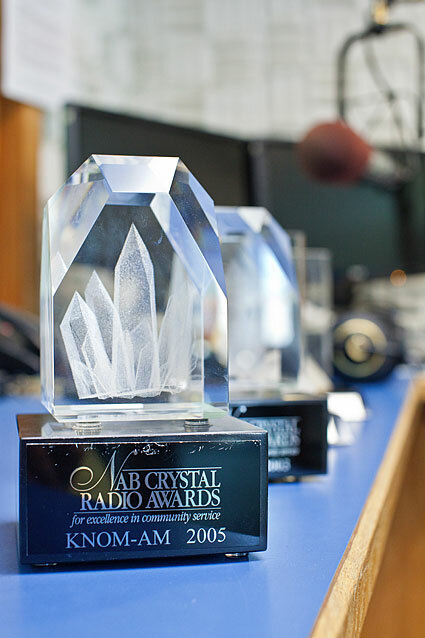 The Crystal Award – which our mission has been honored to receive four times – recognizes radio and TV stations that contribute positively to the communities in which they broadcast. The award puts the spotlight on programming that uplifts and unifies the people who listen to it. We're honored merely to be nominated for this prestigious award, which KNOM won in 1987, 2000, 2003, and 2005 (seen in the photo above). At the annual convention of the National Association of Broadcasters, we'll learn if KNOM has been selected for a Crystal Award. While this will be too late for the print deadline of the May Static, we'll be sure to keep you updated later this year! Whether or not KNOM receives its fifth Crystal Award, we are so grateful for the incredible network of prayers and support that this award nomination represents. As always, we share all honors, awards, and nominations with you – and with all whose dedication makes our mission possible. Because of you, we're changing lives and bringing together communities in Western Alaska. Thank you! The best way to get even is to forgive. At KNOM, we're proud to cover a very wide region of rural Alaska: listeners in over 100,000 square miles of the Alaskan bush count on KNOM for daily news, weather, entertainment, and inspiration. But on occasion, KNOM's signal bounces even farther. 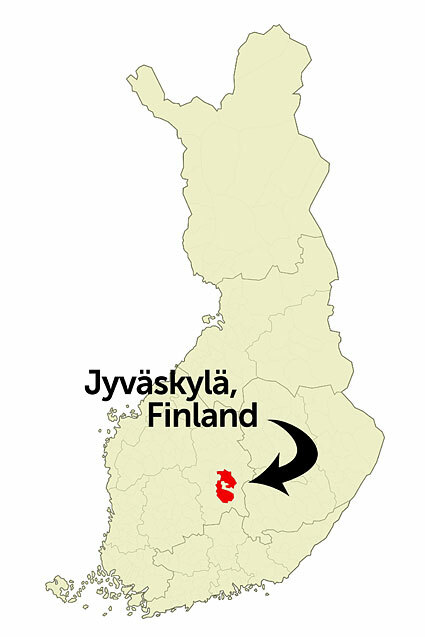 International listeners using high-powered radios sometimes report hearing KNOM as far away as Japan, Taiwan, and, most recently, Scandinavia. 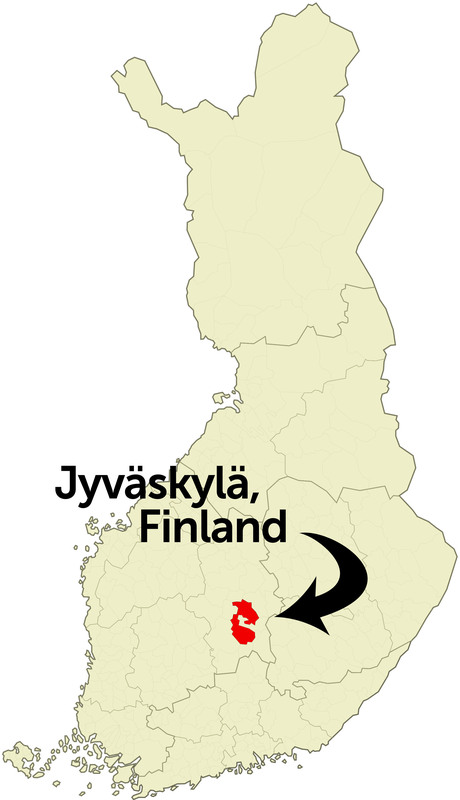 Hans Ostnell of Vardø, Norway and Juha Ylönen of Jyväskylä, Finland (seen in the map above) recently contacted KNOM general manager Ric Schmidt to see if the faintly audible signal they picked up was KNOM Radio. After checking the short audio files the two radio listeners sent, Ric was able to confirm: from more than 10,000 miles away, it was, indeed, KNOM! It's exciting to think that our unique programming, every once in a while, reaches so far. We're so excited to report that, inch by inch, plans continue to move forward for the renovation and expansion of KNOM's broadcast facilities. These plans are years in the making and will take years more to complete, but we're so glad for the support we've already received. The Tom and Florence Busch Digital Studios – seen in the artist's rendering above – are at the center of our renovation plans. Named in honor of KNOM's late founder Tom Busch and his wife Florence (who now serves on KNOM's Board of Directors), the studios will feature digital hardware, which is not only much easier to maintain but, also, more cost-efficient. Ultimately, we believe that our studio renovation will make our mission even more impactful in the daily lives of the people we serve. 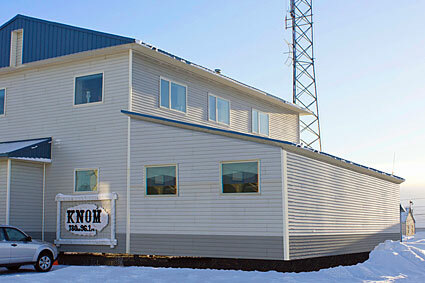 It will ensure that KNOM remains a presence in Western Alaska for years to come. We respectfully ask for your thoughts and prayers as we raise the funds needed for construction; we now estimate that phase one of this crucially-needed project will cost $715,000. Thanks to a very generous donor, the next $50,000 we receive will be paired with a matching gift, dollar for dollar. You'll find more information on the Tom and Florence Busch Digital Studios – including plans, blueprints and lots more – on the dedicated information page on this website. As always, we're happy to answer any questions over the telephone: feel free to call us at (907) 443-5221. Love is like the five loaves and two fish: it doesn't start to multiply until you give it away! Speaking of our facilities: we wrote in the March Static that engineer Les Brown and handyman Rolland Trowbridge were hard at work fixing maintenance problems at our AM transmitter, among other issues. We're happy – and so grateful – to report that Les and Rolland diagnosed and fully repaired our backup power generator. With their speedy efforts, KNOM never went off the air. We're also thankful that Rolland replaced a tire and performed other maintenance on the KNOM vehicle. His work will extend the life of the car by five years, saving us thousands of dollars! There's nothing that unifies and electrifies the residents of Alaska – and shows to people around the world the uniqueness of the state we call home – like the Iditarod Trail Sled Dog Race. 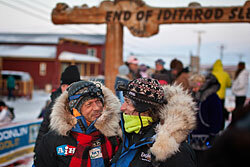 In 2012, KNOM covered all angles of the Iditarod, just like we have since the very first running of the race in 1973. 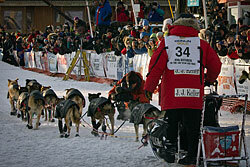 Through the support of local sponsorships, KNOM news director Laureli Kinneen served as a traveling correspondent on the Iditarod trail: an approximately 1,000-mile path that stretches from the forests outside Anchorage through the wind-swept tundra of the Norton Sound coast to the streets of Nome. While Laureli kept our listeners updated on the latest developments in the race, KNOM staff prepared for the arrival of the Iditarod's determined competitors (called "mushers"). With coverage on the air and on the web – through our On the Trail blog – we told the stories of the Iditarod, both for our listeners in Alaska and for curious race fans around the world. The 2012 race confirmed what we've long known about the Iditarod: more than a sporting event, the "Last Great Race" is a source of pride for Alaskans, especially for those in the isolated, rural communities we serve (some of which serve as checkpoints in the race!). The Iditarod is a cherished reason to celebrate all things Alaska, and for the youth of the communities listening to KNOM, this year's race may have been a source of inspiration. 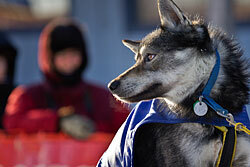 At only 25 years old, the 2012 Iditarod champion, Dallas Seavey, is the youngest person ever to win the race. Commenting on his age at the finish line, Dallas encouraged young people to "Dream big. Go for it! Why not?" It's a conviction that we wholeheartedly share and that, thanks to you, we shared with our thousands of listeners this March. Photos: top: 2012 champ Dallas Seavey at the finish line in Nome; middle: one of the dogs of musher Brent Sass, Rookie of the Year; bottom: two generations of Iditarod mushers – multiple-time Iditarod champion Martin Buser and his son Rohn – finish the race together, in 18th and 19th place. When the going is uphill and you feel down, think of the view from the top.